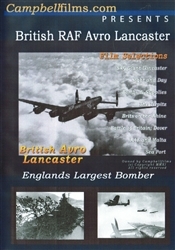 This DVD is a collection of eight films from World War II about the amazing British RAF Avro Lancaster bomber. The Lancaster bomber was an amazingly big and strong four-engine bomber design and used very effectively by the British to bomb Germany into submission by night. By the war's end, the Lancaster was dropping the biggest bombs of the war. These bombs were called the "Earthquaker" because of their massive weight and resulting damage. They were mammoth bombs weighing 22,000 lbs. These were the bombs that sunk the mighty battleship Tirpitz. Film #1 - Sky Giant - This is a great and rare film created by the British Government that describes the Avro Lancaster and the people who built and flew her. Avro Lancasters flew missions to Germany night after night with many daring raids in WW2. Runtime is about 10 minutes. Film #2 - Night and Day - This is a collection of newsreels and stories of how the British RAF fought night and D-Day to beat the Germans: Mosquitos and Lancaster raids, RAF Blasts Germany, RAF Blasts Factories, Hamburg Bombed, Ike inspects RAF, Lancaster Breakthrough, Open Warfare on France, RAF Blasts Nazi Army, Dresden Blasted, Rhine Barrier Blasted, Ruhr Industry Destroyed, 8th AF and RAF Report. Runtime is about 38 minutes. Film #3 - Bombs and Supplies - This film is an extraordinary collection covering the bombs and supplies that the Avro Lancaster loaded in her bomb bay. Plus, the Lancaster is used as a tow plane for the Horsa Glider. Runtime is about 11 minutes. Film #4 - Death of the Tirpitz - This film shows the story of the mighty Tirpitz from her launching to her destruction by the RAF. Using the "Earthquake Bombs" in multiple attempts, the RAF Lancasters finally sink the Tirpitz. Runtime is about 6 minutes. Film #5 - Brits on the Rhine - This film shows both the British ground troops and the RAF taking the Rhine River. Churchill had said that the war would end shortly once the Allies crossed the Rhine River. It is the combined air-ground story: tanks, troops, artillery, Lancasters, and Typhoon fighter bombers are all in this film. Great story. Runtime is about 10 minutes. Film #6 - Dover - This film is a shortened version of the great "Battle of Britain". Runtime is about 10 minutes. Film #7 - A Message from Malta - This is a story that most people may not know about - the battle for Malta. The British along with the population of Malta held out for over a year in great defiance to the German Luftwaffe and Hitler. With only a few RAF planes to fight back and very limited supplies, the Island held. Hitler was furious and bombed the island almost daily, but the British and the islanders held on. Amazing story. Runtime is about 11 minutes. Film #8 - Sea Port - This film is about British coastal concrete pillboxes of WW2 that were built offshore to defend the mainland against enemy aircraft. They were completely surrounded by water and were self-reliant with food, water, sleeping quarters, generators, etc. Runtime is about 7 minutes. Run time is about Format is NTSC DVD and region-free.